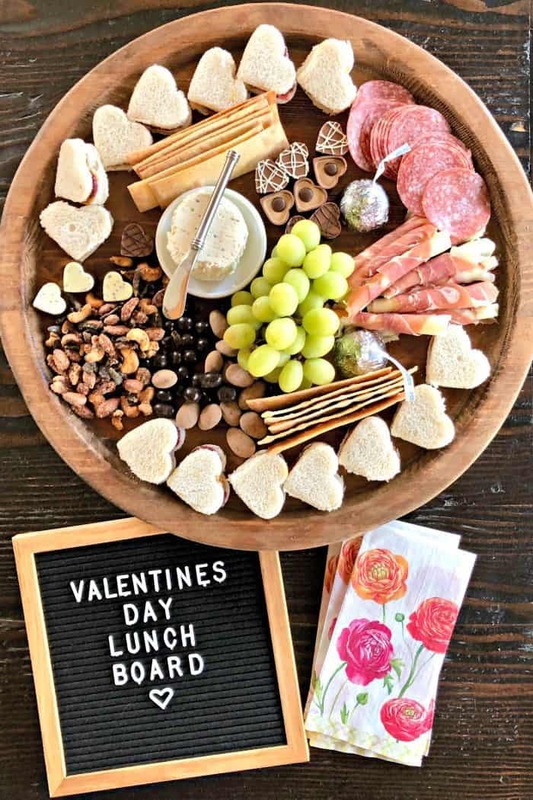 Valentine’s Day Lunch Charcuterie Board, a board filled with heart-shaped peanut butter and jelly sandwiches, meat, cheese, fruit, nuts, and chocolate! 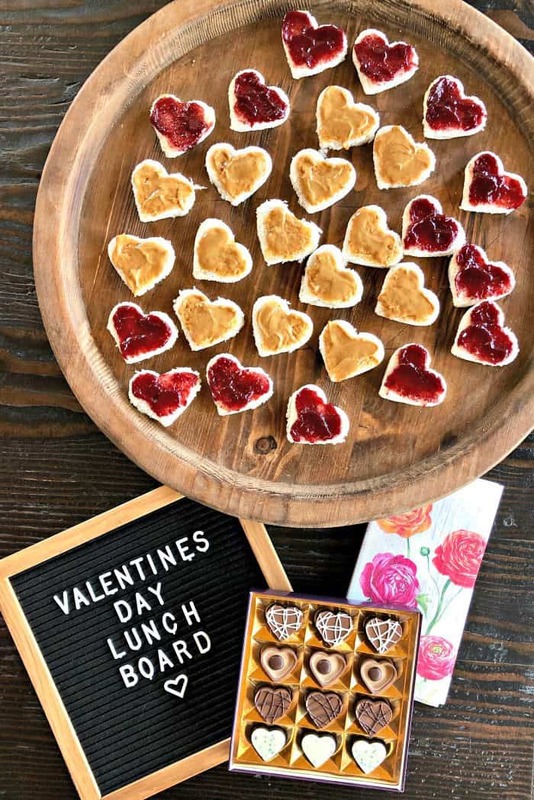 More lovely ideas with a “heart” theme is this Fresh Strawberry Heart Cake and Mini-Heart Shaped Cakes by my friend, BakerMama. I love that we can all get in on Valentine’s Day. 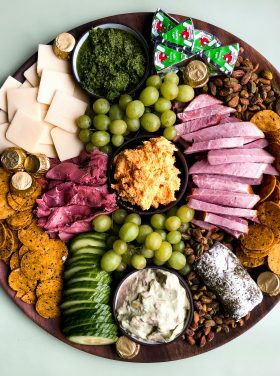 The world needs a little more love, so why not spread it by sharing your table or food (and making this Valentine’s Day Lunch Charcuterie Board)? 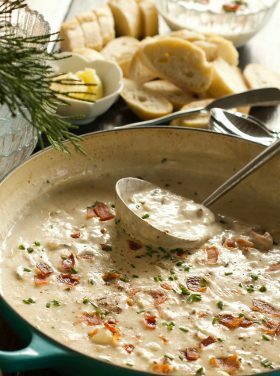 My husband and I have been faithful to schedule in weekly date lunches or date nights. Even when our kids were young, we prioritized it. Faithfully. 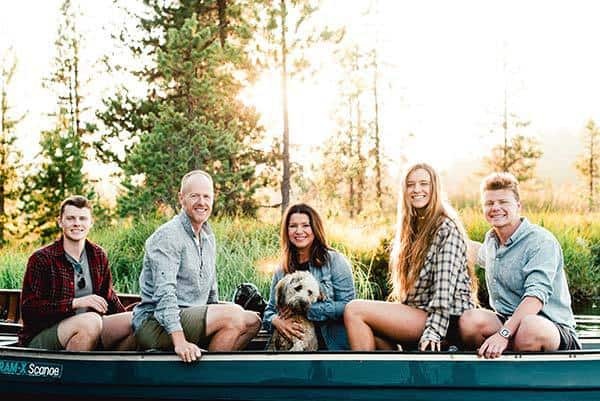 I’ve talked to so many young moms who don’t want to leave their kids, and have tried to encourage them in the importance of “going out.” You can always make something “fun” at home, or change it up and come up with new ideas. 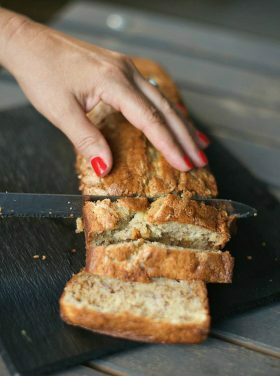 Dates don’t have to cost a lot of money, either. 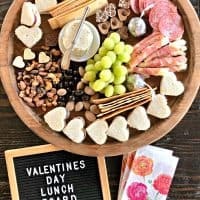 Valentine’s Day is a fun day to make a special lunch or dinner for your sweetie or the kids! 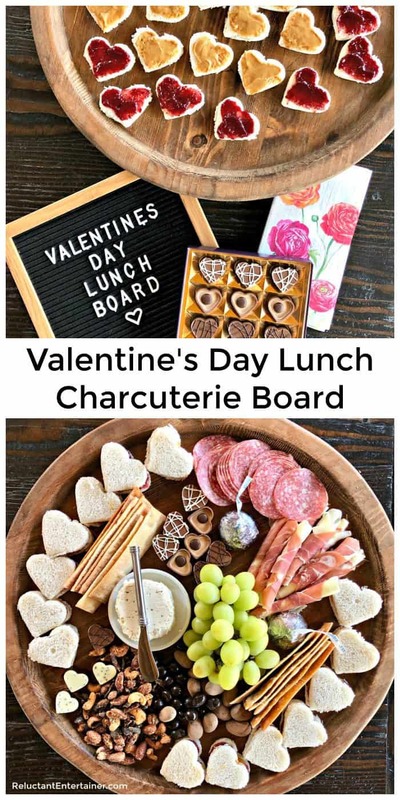 Today I’m sharing a fun Valentine’s Day LUNCH DATE Charcuterie Board. 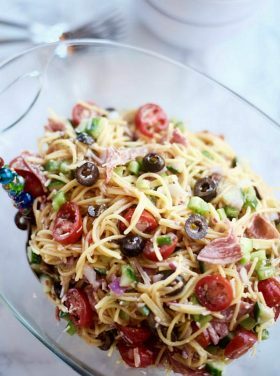 Whether for a lunch date, or a fun surprise for the kids, it’s super yummy! 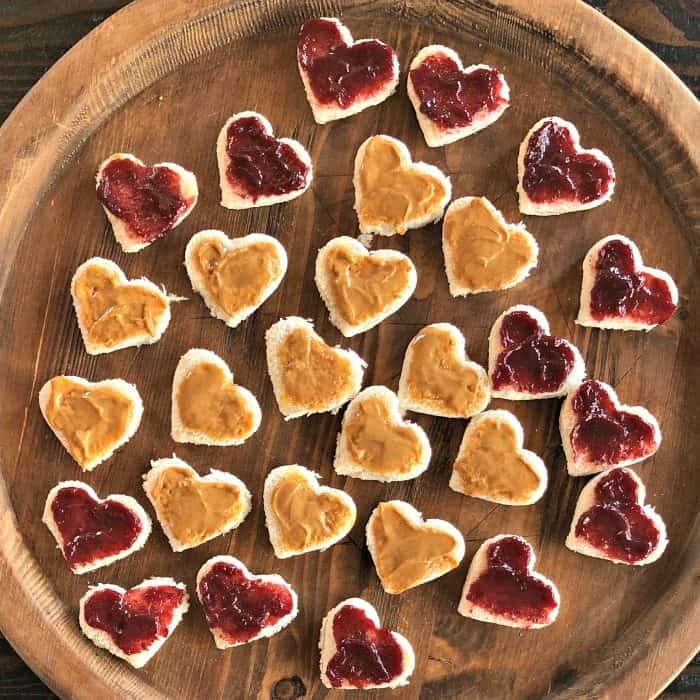 Easy … just make heart-shaped peanut butter and jelly sandwiches. 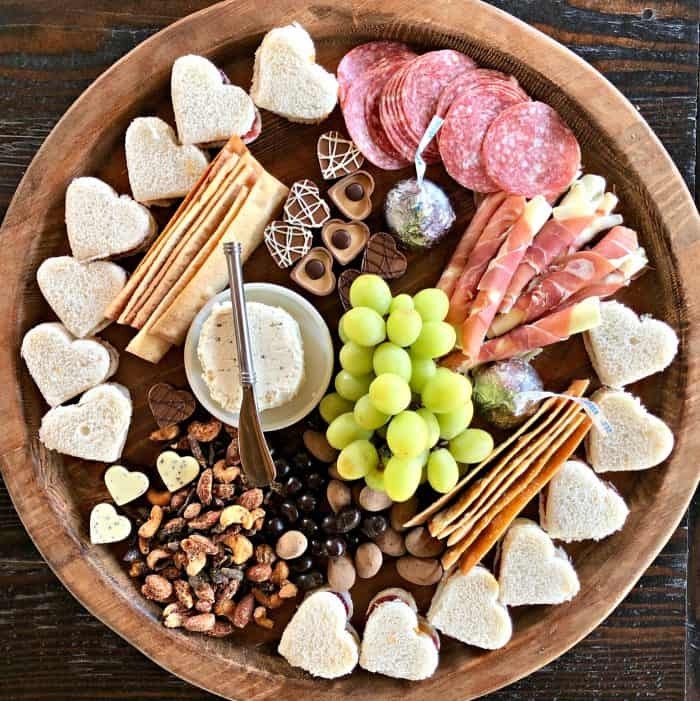 Use a cookie cutter to cut out the heart-shaped pieces of bread! 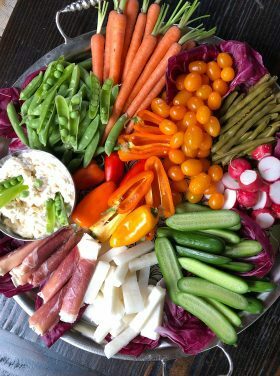 Add your favorite meats, cheese, fruits, and nuts. 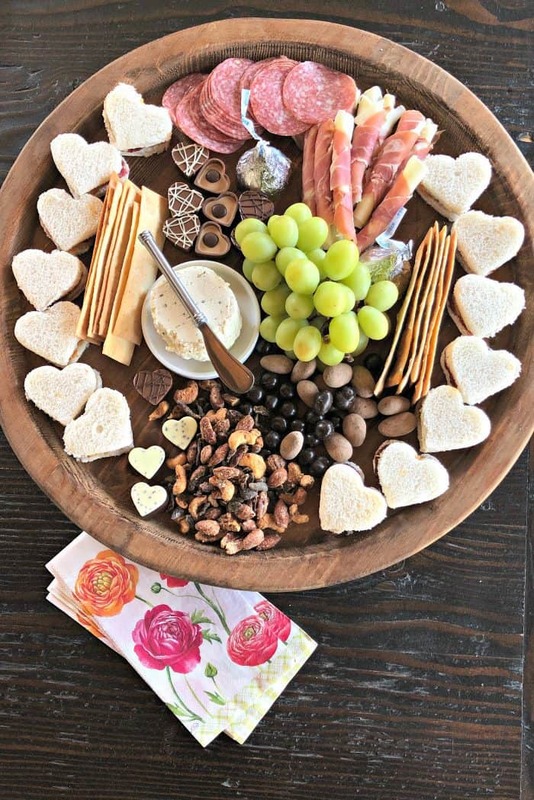 Don’t forget the chocolate heart candies. And 2 giant Hershey Foil-Wrapped Kisses! 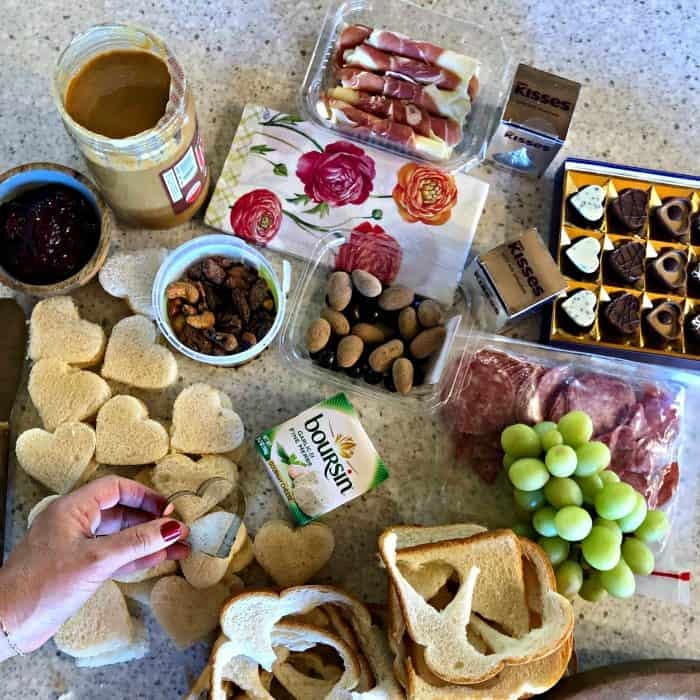 On a scale of 1-5 (1= 1 x a week; 2= 1 x a month; 3= 1 x every 3 months, 4= 1 x every 6 months, 5= 1 x a year), how often do you “date” (get creative with dates) your spouse? These are the days, my Friends. These are the days to not let intimate moments slip through our fingertips, but to enjoy our spouses and invest in them. I’m a big proponent of marriage, if you’ve read my blog for the last 10 years. 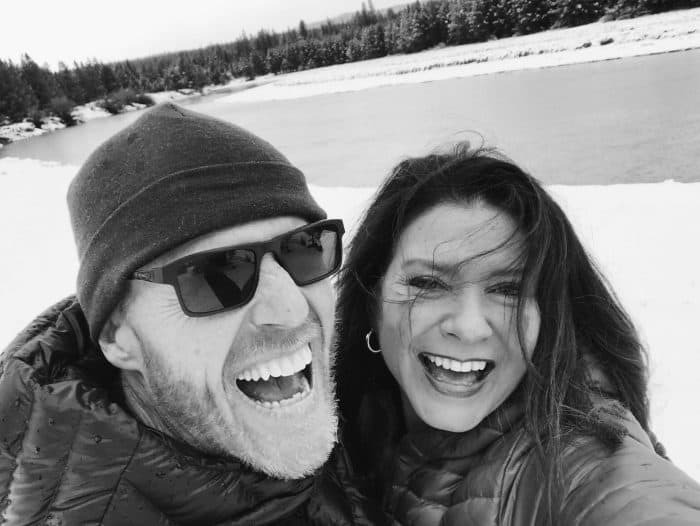 Marriage takes work, time, has a lot of heartache, some hard times, but also so many joys. Celebrate it and get a date on the calendar! 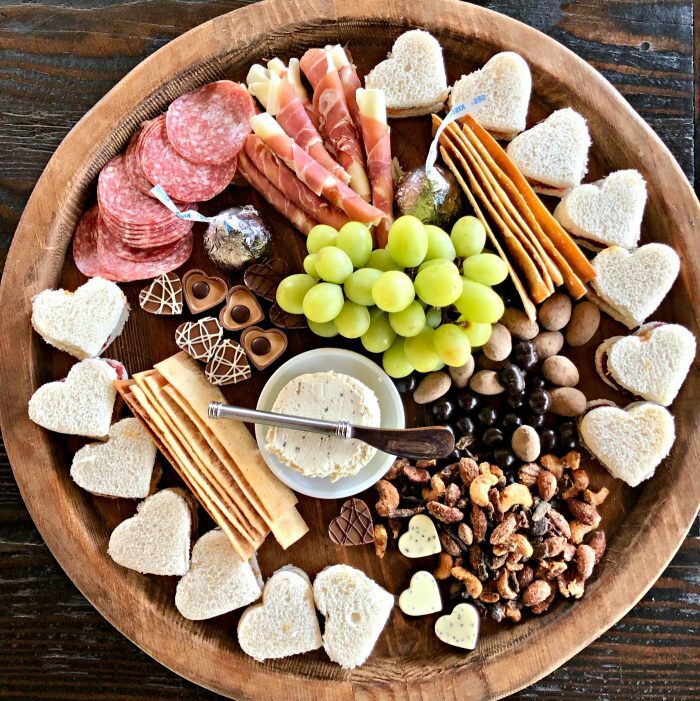 Using a heart cookie cutter, cut out heart-shaped pieces of bread. Make peanut butter and jelly sandwiches. Plaec around the outside of the board. 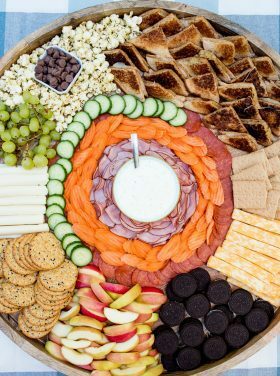 Place the remaining food items on the board and serve! I cannot tell you how much joy your blog brings me! 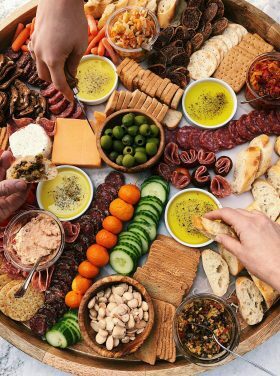 Seriously the only one I read regularly and your charcuterie board ideas have inspired and changed the way I entertain. I now enjoy my company so much more and am excited to entertain again! Not sure I have ever been quite so grateful for a perfect stranger before in my life!! Thank you for sharing with all of us!